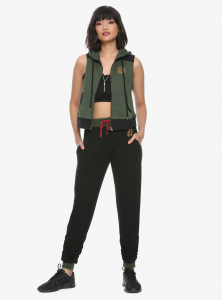 It looks like Disney Parks has some new athleisure-style Star Wars pieces. 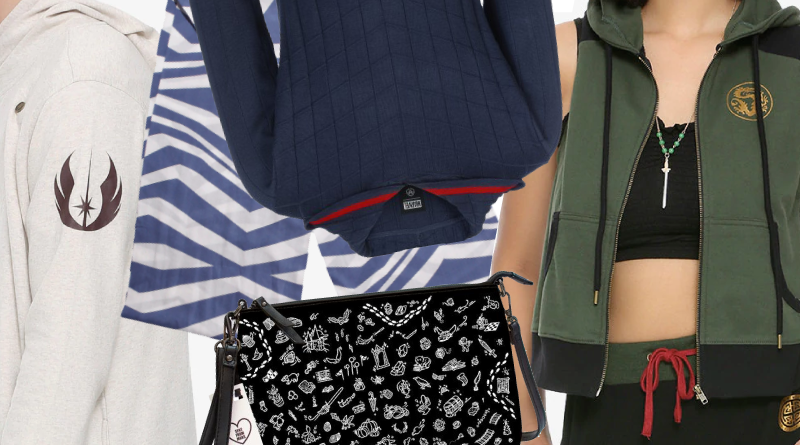 You can also find online at Shop Disney: Star Wars Hooded Tank Top for Women ($32.99), the spray paint style of Star Wars Logo Pullover Hoodie for Women ($49.99), a bold green in the Star Wars Track Jacket for Women ($59.99), Star Wars Shorts for Women ($34.99). 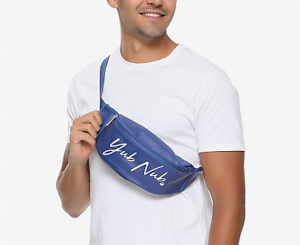 And here’s something a little different at Box Lunch – the Loungefly Star Wars Yub Nub Fanny Pack/Belt Bag ($24.90). Plus now a porg has gotten the Vitruvian treatment with this Box Lunch tank top ($28.90). For SDCC Her Universe/Our Universe put out a Star Wars: The Clone Wars 10th Anniversary collection. 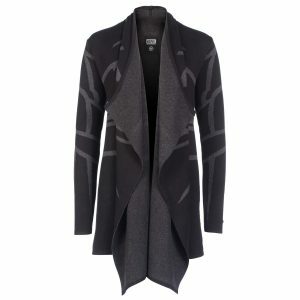 My design picks are the Darth Maul Track Jacket ($79.90), Obi-Wan Longline Sweater ($59.90), and Ahsoka Tano Dress ($69.90 – $79.90). I especially like that the Ahsoka Tano Scarf ($24.90) is a separate piece because it allows for more styling options. 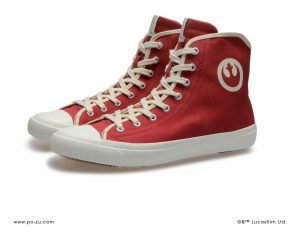 Po-Zu came out with new high-top lace-up sneakers ($90.47) in organic cotton featuring the Rebel Alliance symbol and unisex sizing. They’re available immediately in black* and in red*. Hero Within’s new Superman 80th Anniversary Blazer first shown at SDCC is now on their website with the convention exclusive price of $179 (regular price $199). Musterbrand’s Marvel collection is now available for pre-order. Stand-outs include: the Black Panther Crewneck ($99.99), Black Panther Ladies’ Cardigan ($129.99), Spider-man Ladies’ Cardigan ($129.99), Spider-man Hoodie ($109.99), and Captain America Cardigan ($129.99). CLAUS Studios, who did the end credits art for both Deadpool movies, is part of the MARVEL Artist Collaboration Series. 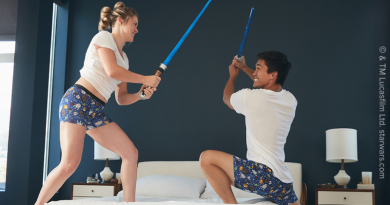 This means you can get Marvel designs in that style on men’s pajamas at Target such as Black Panther, Iron Man, and Groot and Rocket ($17.99 each). This Mickey Mouse romper ($44.99) from Shop Disney is on the nose but also cool in its simplicity. Meanwhile a smattering of Mickey faces appear on this Mickey Mouse Pullover Sweater for Adults ($39.95). Shop Disney also has a bunch of Hocus Pocus items, collected in one place on Disney Style. Plus the shop has a few princess-focused fashion collections where they’ve put together a few character items that can be worn together like this one for Belle ($16.95 – $49.95) and this one for Jasmine ($16.95 – $39.95). Designed by the winners of 2017’s Her Universe Fashion Show (Grace Duval, Lindsay Orndorff, and Rose Ivy) Destination Disney also focuses on Disney Princesses. There’s the athleisure look of the Mulan Scrunch Jogger Pants ($36.90) and Green Hoodie Vest ($29.90). The Moana skirt ($36.90) even has pockets. The Tangled Crossbody Bag ($39.90) could go with a variety of outfits. And the Ariel Smocked Shell Shirt ($32.90 – $36.90) and Magic Carpet Handbag ($54.90) are great for Disneybounding. Also check out a kid-sized Mushu Dress ($29.95) and an Edna Mode Enamel Pin Set ($14.90). 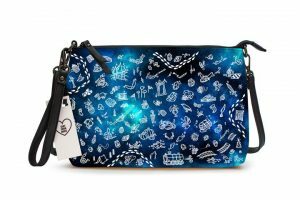 Sent From Mars’ Magic Doodles Purse ($64.50) pre-sale is on with twelve color combos from which to choose. Hurry pre-orders are open until August 1st. The Marvolo Gaunt Ring Handbag ($79.90), the 2nd of the seven-piece Danielle Nicole set based on the Horcruxes of Harry Potter is out now at Box Lunch. Meanwhile the Howler Enamel Pin ($8.90) is a bit frightening. Sometimes you just need a T-rex necklace to complete an outfit: Jurassic Park T-Rex Skull Necklace ($14.90). And sometimes you just need a Jurassic Park patch ($6.90) to make a clothing or accessory item more Jurassic Park-y. Moncler’s fall campaign “Beyond” features Star Wars’ John Boyega and Stranger Things’ Millie Bobby Brown. Hespera’s GemFire Ring, the style worn by Cersei Lannister on Game of Thrones, was the subject of my latest geek fashion review. Luxury fashion brand The Blonds will be using Disney Villains as part of their next New York Fashion Week collection. See three sketches at Disney Style. Pinup Girl Clothing reposted a Everyday Cosplay Kim Possible look from one of their customers over on Instagram. And Disney Style has 4 vintage outfits inspired by Tiana from The Princess and the Frog. Looking for more? 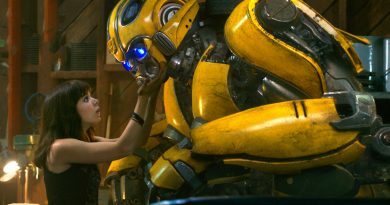 Check out my June and May picks.